Read about - Montes Reef Resort below. Montes Reef Resort is a fully licensed Resort about 54 kilometres from Airlie Beach. 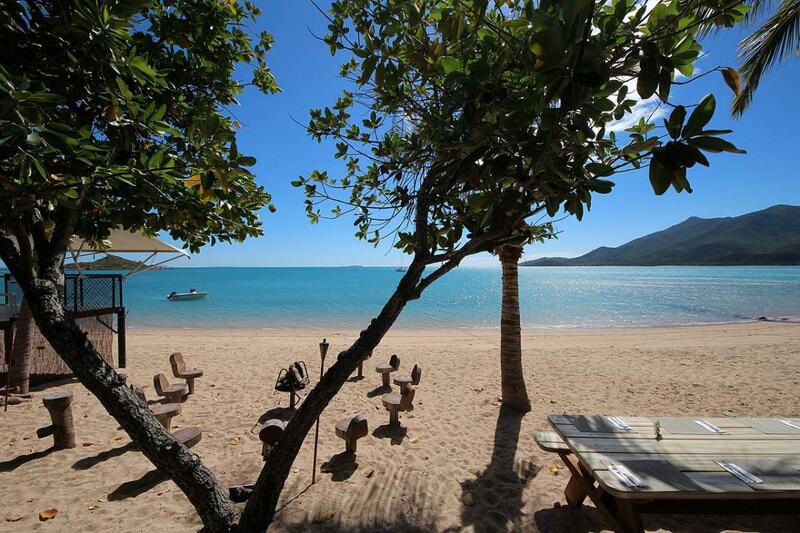 We headed up to Cape Gloucester for the day and had coffee at Montes Reef Resort - what a great location. The Restaurant overlooking the bay was very busy and popular with tourists. The large covered eating areas are beautifully shaded and comfortable - the staff were friendly and our coffee came out in no time. They were happy to show us the bungalow-style accommodation which is situated right on the water edge - the beach is right on your doorstep. Each bungalow is self-contained, air-conditioned and has a 180 degree panoramic view of the ocean and nearby islands. This looks like a lovely spot to spend a relaxing holiday with activities like snorkelling, fishing, canoeing bushwalking etc. It was very still the day we visited Montes Reef Resort and the ocean looked like a great spot for stand-up paddle boarding - an activity our son really enjoys. have you been to Montes Reef Resort? Explore Montes Reef Resort - Hideaway Bay with RvTrips and find out where to stay, what to do and what to see. Helping caravan, motorhome and camper owners have a great holiday.